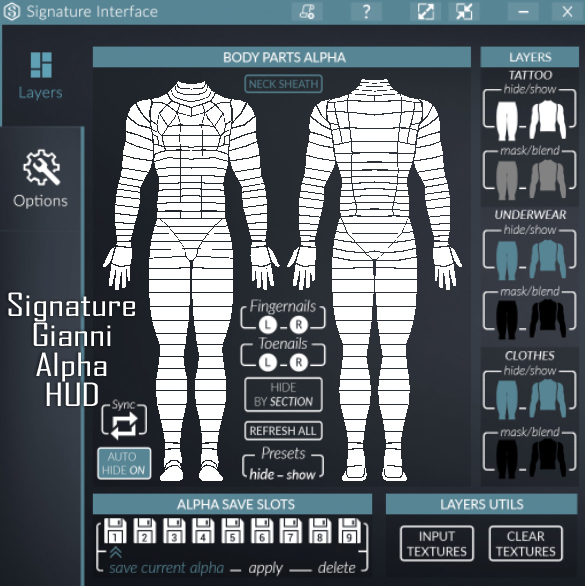 Unless you’re a complete newb to SL or you’ve been living under a rock for the past couple of years, it won’t have escaped your attention how quickly Signature Gianni has become the de facto ruler of the male mesh bodies. I call it the ‘Male Maitreya’, since clothing rigged for it has monopolised much of the menswear market in the same way that Maitreya’s Lara body is monopolising the market for the ladies. But, with the recent release of Signature’s new Geralt body I figured it was time to do a review and comparison of them both, note down the pros and cons of each, and give you a little more info on them. Skin used throughout this post: Stray Dog – Levi (tone 04). As you can see, the default shape has a long torso and short, powerful legs, giving it a low centre of gravity. Perhaps the most obvious feature of it is the deltoids: those rounded outer shoulder muscles. I can always tell which guys are wearing Gianni, because of those. Other than that? It’s a solid, fantastic body with a HUD that’s a doddle to use. 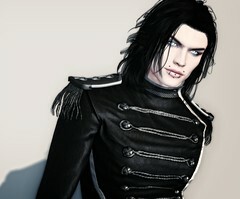 There is a metric fuckton of clothing available for it, and that includes the more unusual and avant-garde stuff. There is also a lot of kinkwear being made for Gianni, so if harnesses and leather are your thing, then this one is a must. So recently-released that it’s barely got its feet wet, Geralt is Signature’s second body, and it’s less ‘gym-buff’ and a bit more ‘Bloke in the Street’. While it retains Signature’s superb shaping, the musculature is less-pronounced. This guy makes it to the gym perhaps once a week. In fact, he probably swims and runs more often than he lifts and presses. With the default shape it’s overall a bit more balanced than Gianni. The centre of gravity is just below the navel and actually central, and the legs are just a little longer than the torso. The lats are still pretty worked but the obliques are tighter and less bulky. 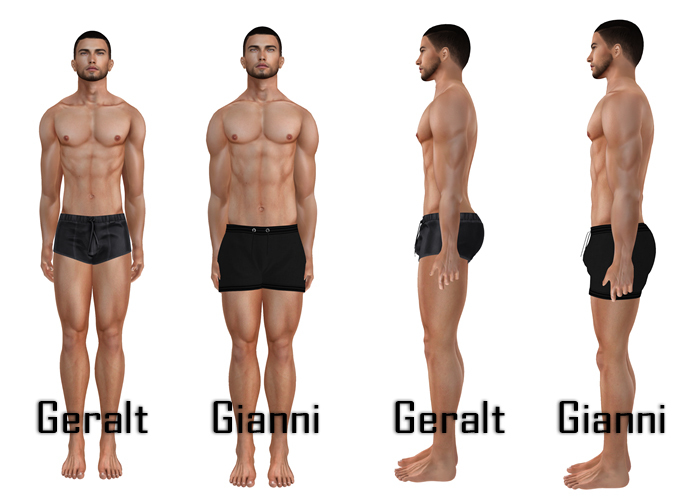 The quads and calves are also less pronounced than on Gianni. 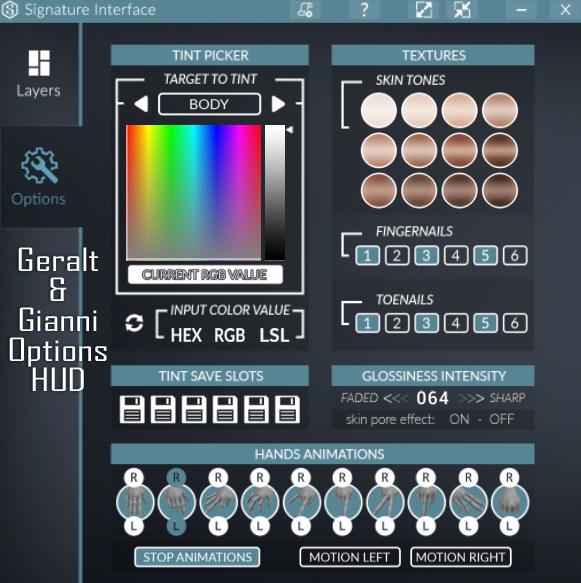 The Options tab of the Geralt HUD is the same as that of the Gianni HUD, above. As with Gianni, Geralt costs L$3,500 and the demo is free. 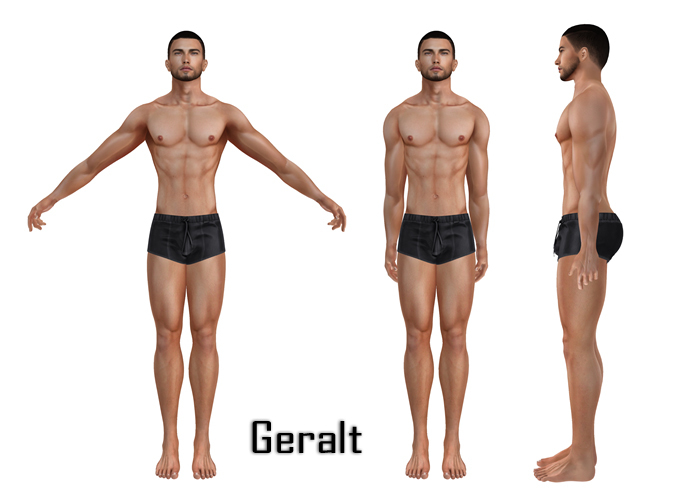 You get the same items in the Geralt folder as you do in the Gianni one (although, obviously, it’s a different body!) so we’ll move onto the pros and cons. Very little clothing is available for it yet, since the body is so new. (There is some available in the Geralt section of the Signature store, to get you started.) 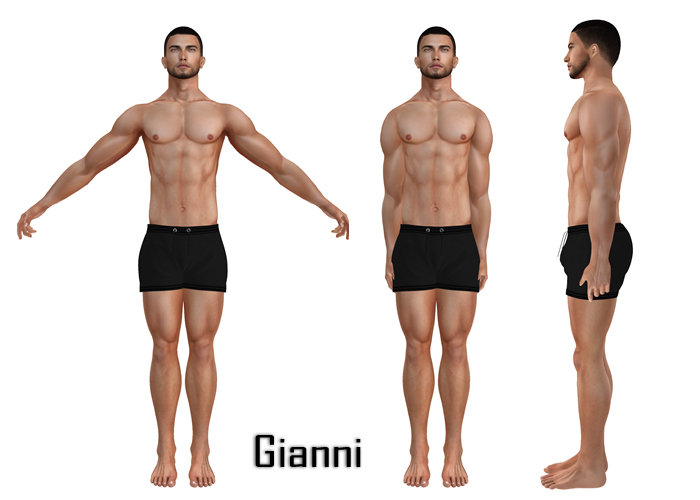 However, please note the date of this post (April 2018), because I fully expect this body to become as popular as Gianni, so at any time in the future the amount of available clothing will have increased. Those side cuts on the lower torso? They’re needed for every single open-fronted shirt/jacket-with-bare-chest look you might want to wear. It’s the one main failing of the Slink Physique HUD that I’m constantly struggling with when I wear that body. 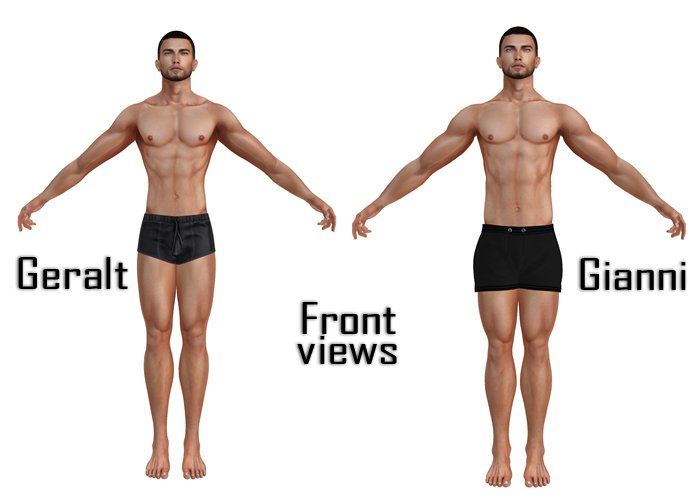 With the cuts on the right (Geralt) you can only alpha out a circle all the way around the lower torso, instead of the multiple options that you have with Gianni of front, back, left side, right side. All that said, I would still recommend both bodies. I’ve already seen a couple of clothing items rigged for Geralt at menswear events, so I suspect it will catch on fairly quickly. ETA: Sure enough, at this month’s (April 2018) The Mens Department event there are already multiple creators selling items rigged for Geralt. I’ll close with some comparison side-by-side views. 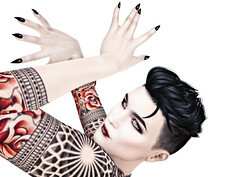 Each set of pictures was taken with the body’s default body shape (I used my Catwa head shape for both, editing it to have identical body sliders to the body being photographed), and from exactly the same angle and distance. 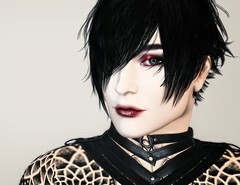 This entry was posted in Mesh body reviews. Bookmark the permalink.